It was several hours before dawn when Afthas Niflal, a young fisherman in southern Sri Lanka, felt the sea start to rumble beneath him. Israel's crippling blockade of the coastal territory of Gaza is pushing desperate young Palestinians to ever more extreme measures in the search for livelihoods, despite an agreement granting Gazans greater access to their agricultural land. Minda Moriles, 56, has worked at sea most of her life. A resident in a coastal community in the city of Las Pinas, part of the Philippines’ National Capital Region, her earnings are dictated by what she can catch off the shores of Manila Bay. The sea is all that 40-year-old Arul Das has mastered. From looking at the clouds or from the direction of the wind, this fisher from northern Jaffna can predict the condition of the sea fairly accurately. Boats were tying up at the jetty and there was a bustle of activity as vendors cried their wares, offering shellfish to potential buyers, while young people, sharp knives in hand, filleted sea bass and red snapper. Meanwhile, on the promenade, octogenarian musicians played old-style cumbias and boleros for restaurant patrons. Mahalakshmi, a housewife married to a farmer, is afraid for her family’s future. 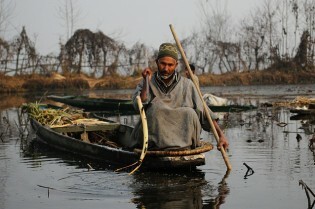 The fifty-two-year-old woman is also frustrated that Indian authorities have "betrayed" poor villagers. A coastal city, Sierra Leone's capital, Freetown, is an area where people have relied on the ocean for food and employment for as long as they have lived there. Shortly after Israel and Hamas signed a ceasefire agreement on Nov. 21, the Israeli navy abducted 30 Palestinian fishers from Gaza's waters, destroyed and sank a Palestinian fishing vessel, and confiscated nine fishing boats in the space of four days. “From the coast to eight miles out, the sea is like a desert: it's sandy and there are no fish.” Mohammed Al-Bakri traces a thick line on the wall map before him, following the lines of Gaza's eastern and northern borders, continuing south from three miles off the coast.